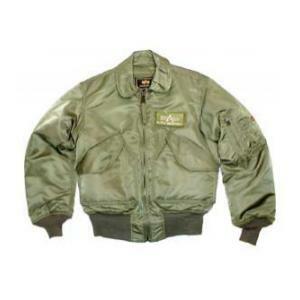 This Alpha flight jacket has a 100% nylon flight satin outer shell. It is fully lined with quilted flight nylon and polyester fill. It has knit cuffs, waistband, storm flap, two fully lined cargo pockets, combination utility pocket on sleeve, removable velcro logo patch and is water repellent. US materials sewn overseas to military specs.